It’s not the key signatures or the individual notes that are causing problems. No, it’s the totality of notes, the fingerings, and particularly the rhythms that are so challenging. When I told her I hated playing this piece and found every excuse in the book to avoid practicing it, she was shocked. And explained that sometimes we like pieces that are too easy for us when what we should be doing is playing harder pieces that stretch and challenge us. Hmm, she’s right, of course. Where did one so young acquire such wisdom?? Perhaps it’s true that humans too often try to take the easy way out. The road of least resistance, you might say. I grumble that I’ve only been playing flute two years. How am I expected to remember fingerings, notes, breathing, how to double-tongue, how to play with vibrato, and all the rest … at the same time? She won’t let me succomb to excuses. And when she discovered she couldn’t tap her foot to my beats, she suggested I download a speaking app onto my phone. Something that would sit beside me, much as a teacher would for a beginner, and count out loud. I’ve got metronome apps that play with clicks, drum taps, wooden blocks, even a barking dog or a pulsing light. But a speaking metronome? What a brilliant idea! So brilliant that I stayed up late that night, browsing the app store for just the right download. And maybe I’ll surprise her at my next lesson! This entry was posted in Uncategorized and tagged flute, music lessons, rhythms, sonatina. Bookmark the permalink. 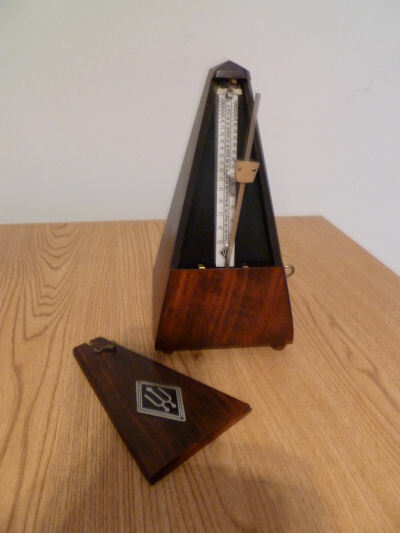 I often used a metronome, albeit the old-fashioned kind. I’ve always enjoyed the sound of a wooden one; it’s much like the sound of the pendulum of my grandmother clock. I think I’d find a speaking one distracting, but I never had a music instructor who would speak while I was playing, so it may just be a matter of what’s famliar. I hope you find the perfect one for you. And thanks for sharing that wisdom from your teacher. She’s right on, about preferring what’s easy for us! Linda, I find ALL metronomes distracting. We had to take typing back in school (gosh, who takes typing nowadays?!? ), and our teacher had some kind of timer that clicked annoyingly while we were working. It’s a wonder I ever learned how to use a keyboard!! That said, I find the talking version less bothersome. Of course, I’d prefer a better-modulated voice with a nice Southern drawl (or perhaps a proper British accent or an Irish lilt! ), but I didn’t get those options. Something tells me it’s working though, so I guess it’s succeeding! Excellent, Debbie. A life lesson for sure. Stretch oneself and enjoy the growth. Thank you, John. Not entirely sure stretching oneself is enjoyable all the time, but it’s necessary for us to grow and improve! Yeah. My knee is a perfect example. The pain is with the gain. I’m glad to hear you’re mending — keep doing those exercises so you can dance all around the state!! Debbie, I LOVE the quote! You always find the best quotes for your post topics. They’re perfect! I quickly listened to the sontatina link you provided for us and LOVED it. What a beautiful piece, but I can definitely see why it could be challenging. I know this sounds crazy, but I love the sound of a metronome. When I was a kid, my piano teacher used to use one during my lessons. She’s right. When I was still doing stage acting, I could always tell when I needed to challenge myself with a particular role by how AFRAID I was. I knew, regardless of how fearful I was, that I needed to do it because I would learn something. And I always did because it would prepare me for the next challenge. I can honestly say that in all years that I was acting, my greatest satisfaction and personal rewards were the roles that I was the most afraid of. I applaud you, my friend. I am so enjoying hearing about your journey in taking up the flute. And very proud of you! Have a fantastic week! And Happy Labor Day! Ron, you always know what to say — thank you!! Yes, I can see how playing an instrument is akin to acting. They both require loads of work, even more courage, and a certain ability to withstand possible criticism. And I am so grateful I found this teacher. She really knows her stuff and, despite our age difference, she refuses to allow me to wheedle out of things that are potentially good for me! Thank you for taking the time to listen to even part of my Sonatina. It’s coming along, but oh, my, all those sixteenth-note runs have my fingers flying, ha!! Not sure I’ll ever master this one, but I take comfort in knowing I don’t have to perform it for an audience, ha! It’s not the talking aspect that annoys me — it’s the fact that the incessant voice keeps going when my fingers stop!! Who knew there was such a thing as a speaking metranone? Our band director stretches us too. I’m with you. I don’t like practicing such hard music! I guess it will be worthwhile … some day. Right now, it’s awfully hard!! Hopefully she’s also assigned something more fun to play! This little music lesson can also apply to life.